Cycle Rural Japan Tour — Bushido Japan - Adventure Tours and Salamander Conservation. 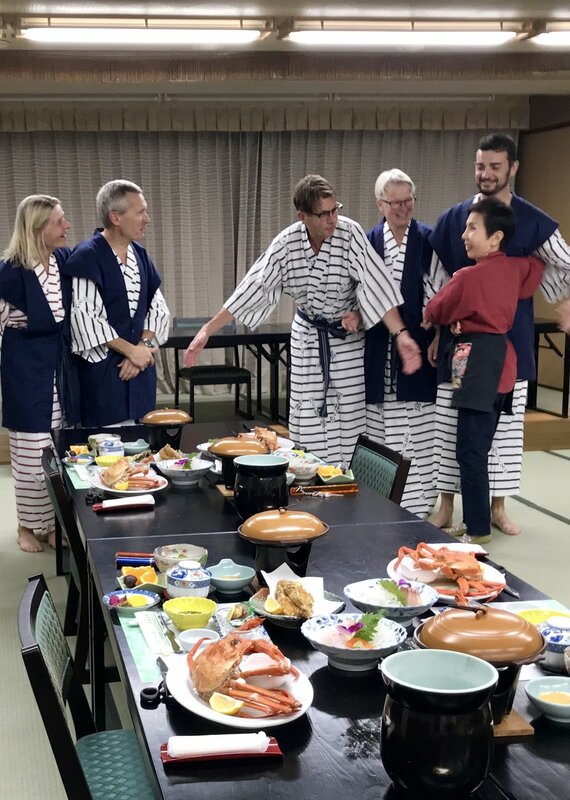 Join Japan expert and cycling guide Richard Pearce for a special tour through the San-in region of Japan; a region of stunning beauty, rich in history and folklore, and of spiritual importance to the Japanese. San-in features heavily in Kojiki, the oldest surviving chronicle of the mythical origins of Japan and its gods, and is seen as the birthplace of Japan. We follow a route in a famous Kojiki tale of the Deity Ōkuninushi and a white hare, between Inaba and Izumo, now known as Tottori and Izumo. Our adventure begins near Tottori City, as we start our journey along the San-in coastline on the Sea of Japan, to Mount Mitoku, an ancient Buddhist Temple complex. Here we visit Sanbutsuji Temple and have tea with the priests. We will spend the night in traditional lodgings in Misasa Onsen, a spa-town famous for the health restoring properties of its water. Our journey continues west to Yonago City, passing through rice fields, pear farms and fishing villages in the shadow of the stunning Mount Daisen. The next morning, we begin cycling from the top of the mountain. As we glide through beech forest and lush pastures, we can enjoy spectacular views over the Sea of Japan and of the majestic mountain itself. 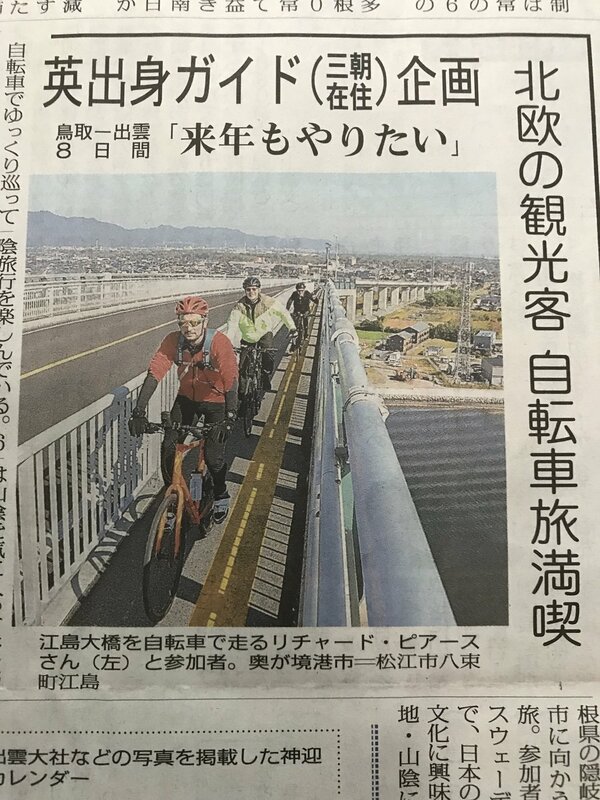 At the seashore, we cycle along a newly opened coastal cycle path that takes us to the Sakaiminato ferry port via Ejima Bridge, the third largest of its kind in the world, and the small islands of Eshima and Daikonjima. The next stage of our journey takes us by ferry to the remote Oki Islands, once a place of exile for former emperors, for a two-night stay. Here, we cycle on Nishinoshima and the Dogo Islands, and walk the breathtaking Kuniga coastline. Back on the mainland, the tour takes us to the “power spot” Mihonoseki Shrine where we can see the morning dances performed by the shrine maidens, before continuing along the stunning coastline en-route to Matsue. The penultimate day will be spent exploring Matsue, with its impressive, original castle and the world-famous Adachi Museum. Finally, we continue west along the along beautiful farm roads to Izumo Taisha, Japan’s oldest Shinto shrine and our goal.